The transformation from drug addict to mom is absolutely amazing. Addiction to hard drugs like heroin and meth are becoming extremely common in America — more so every year. Just in the past five years, several people I knew or worked with died from an overdose. While I thought it seemed like just a coincidence, it turns out that this is happening all over the country. According to the National Survey on Drug Use and Health, over 7 million Americans fought with drug abuse just during the year 2014. The numbers are staggering and the odds are looking dim. However, one 26-year-old mom from Arizona bravely told the world about her addiction as well as her journey to sobriety. 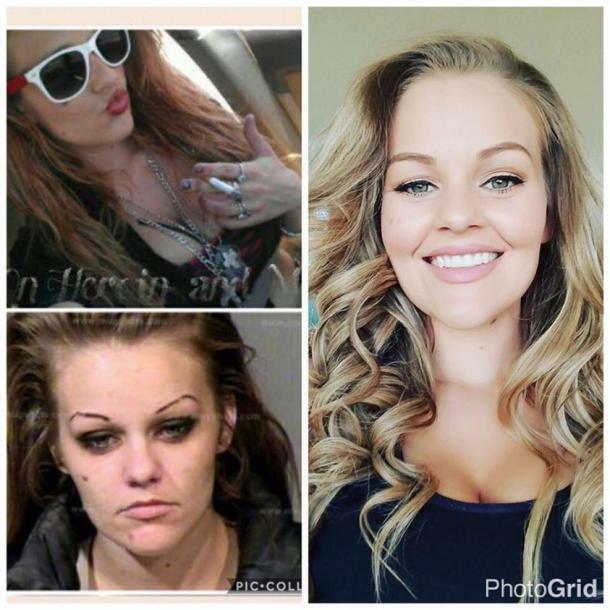 Four years after beating her addiction to meth and heroin, Dejah Hall posted an inspiring Facebook photo that went viral. As the world grew more curious to hear her story, Hall was interviewed by multiple media outlets. In an interview with ABC 15 News, she said, “My grandfather was sitting in his wheelchair, and he looked at me and said, ‘You’re hurting me, Dejah.’ I went to the bathroom, and I looked at myself and I really looked at who I had become. This disgusting person who needed to continue to stick these drugs in their veins because I couldn’t function." It wasn’t long after that she promised to clean up her act after she was arrested on felony drug charges. While she stated that she could still get drugs in jail, Hall decided to quit cold turkey and never look back. Now out of jail, she is pursuing a Bachelor’s degree to become a prison minister and has also become a mom to a beautiful little girl. She claims to have undergone both a physical and spiritual transformation and found God while in prison. Since her post went viral, Hall has received a whole whirlwind of both negative and positive comments. While the negative ones have caused her some emotional pain, Hall knows that it’s worth it since she has been able to inspire others. Hall’s recovery has been absolutely astonishing and her before/after drugs pictures are almost unrecognizable. Sobriety and recovery from drug addiction are possible, and Dejah Hall wants everyone who is struggling with drug addiction to know that there is hope.